Camp Gilead is currently involved in a Capital Campaign to build new housing facilities and restrooms. To see details on this project, CAPITAL CAMPAIGN. The camp is in constant need of attention. If you or someone you know has the time to come and work, we will put you to work! Contact your church and set up a work group. This could be a great ministry for your youth group to participate in as well. Check out a few of the projects completed by campers and our network of churches, RECENT PROJECTS. Join us through amazon smile! The “Memorial Scholarship Fund at Camp Gilead” was established in 1999 in memory of Taryn Kelly, a life-long camper and beloved summer staff member with a burning passion to see the lives of her campers changed. Since then, families and friends of staff members, campers, and founders of Camp Gilead have donated in memory of their loved ones, so that Taryn’s passion and ministry might be carried out in the lives of campers who would otherwise not be able to afford to attend a week of camp. Over the years, hundreds of families have been blessed with partial or even full scholarships as their needs have been made known to the camp administrators. We are so very aware of the Sovereign and Faithful God whom we serve. Without that awareness, personally and daily, we would not have the Hope that only He can give. Please contact the camp office if you would like to donate to this fund, whether in memory of a loved one or just a general gift. Applications to receive Financial Aid are available by contacting the camp office as well. 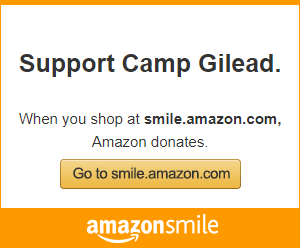 There are many items which you may be able to help contribute to the ministry at Camp Gilead!